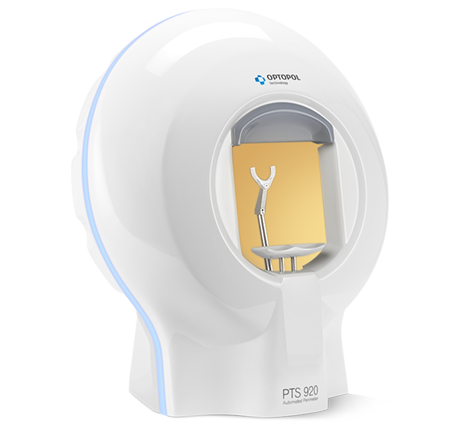 PTS 920 contains complete set of standard perimetry tests. Variety of threshold algorithms and screening techniques to choose from, always give the right answer for specific medical case. Thanks to wide range of testing point maps organized in radial patterns, stimuli are denser in the center and help to find central scotomas (contrary to popular 30-3 and 24-2). With PTS 920, all special tests like Binocular Driver’s Test, Flicker perimetry and Blue on Yellow* test become fast and easy. Advanced strategy which utilizes a special testing algorithm, allows quicker examination without loss in result resolution. Radial equivalent of 24-2 and 30-2 field can be tested in less than 3 and 4 minutes respectively. This fast and repeatable procedure provides you with more detailed information than screening strategies in comparable duration. Shorter testing time directly translates not only to higher patient throughput but also to patient comfort and test result reliability. 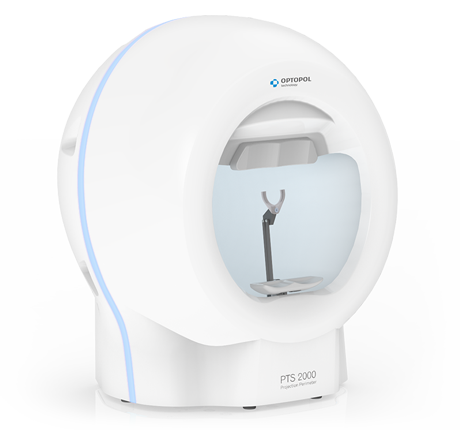 PTS 920 features high resolution camera for precise monitoring of patients’ compliance. Blink control mechanism assures that no stimuli are omitted due to normal blinking. Expositions interrupted by blink are repeated, and test is held until the eye is opened again. 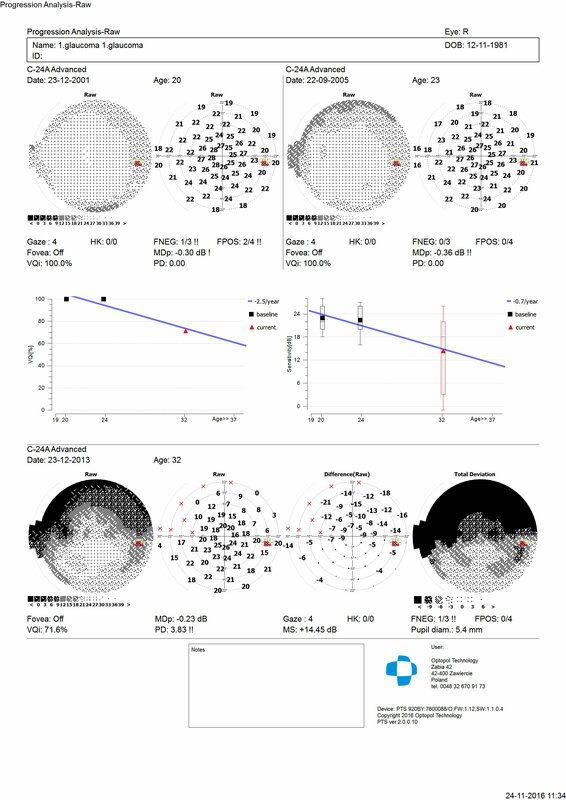 Constant eye tracking mechanism analyses pupil movement and assures supreme reliability of test results. PTS 920 contains rich library of predefined test fields and programs. Intuitive software provides means of creating custom programs and test point patterns. Custom test settings can be stored and accessed with one mouse click. This helps to save valuable staff time and assures optimum patient flow with minimal effort. Follow-up tests can be performed with ease, by simple selection of base examination and starting the new one. Testing of difficult patients is made easy with PTS 920. Partial test results of not completed test can be stored in patient’s record and continued in the future. PTS 920 built-in networking features assure that all the data can be accessed from anywhere within your network. Networked reviewing stations can display and review data updated in real-time by examination host machine. With networking facilities, PTS 920 provides optimum conditions for undelayed practice workflow. PTS 920 with its out of the box DICOM support, allows seamless integration of perimeter into your DICOM environment. 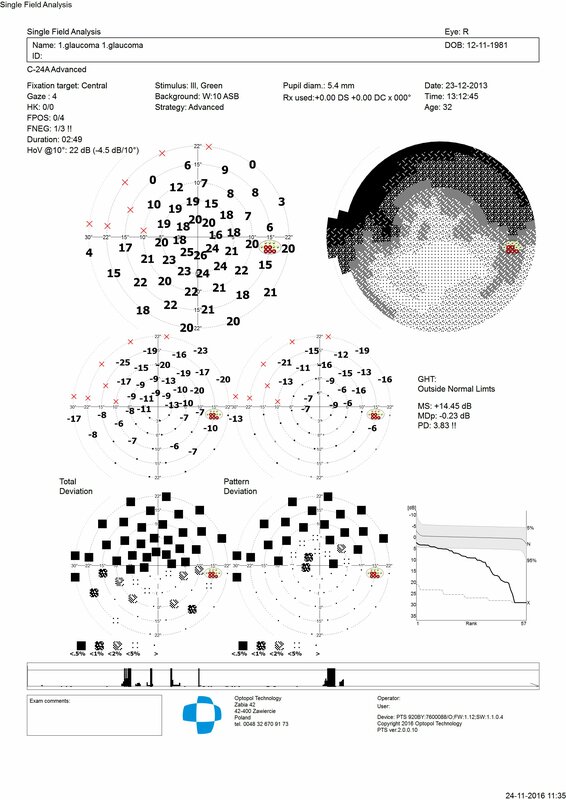 Storing visual field reports on the DICOM image server is made easy with PTS 920. Thanks to DICOM Modality Worklist support operator comfort is increased and the risk of transcription errors eliminated. Besides DICOM, PTS 920 supports also GDT and custom EMR’s based on text file interface. This allows your practice to be up to date with today’s information technology. PTS 920 features a user friendly voice guide module. Voice messages assist operator and patient during the examination and help to efficiently complete the test procedure. Thanks to this remarkable feature, operator always knows when the special attention is needed and can eliminate risk of results variability problem with difficult patients. 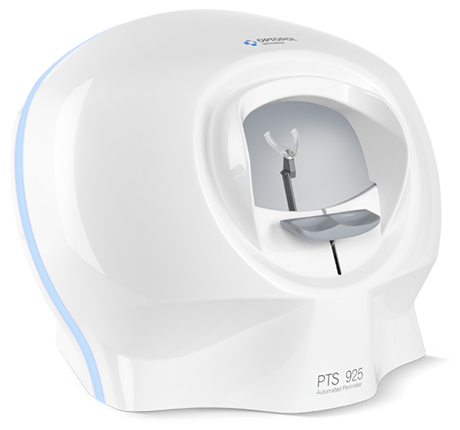 PTS 920 offers complete palette of analysis tools for quick and thorough assessment of visual fields. Advanced analysis algorithms supported by normative and statistical data help in comprehensive identification of defects. Comparison and progression module available in standard package help to gain advantage in long term results evaluation.